When you name your movie Over the Top, you are all but goading the audience to jeer. When you add the premise (trucker builds bond with wealthy son through arm wrestling competition), you really are asking for it. Over the Top is by no means 'good', but in fairness it's not as horrible as I was led to believe. 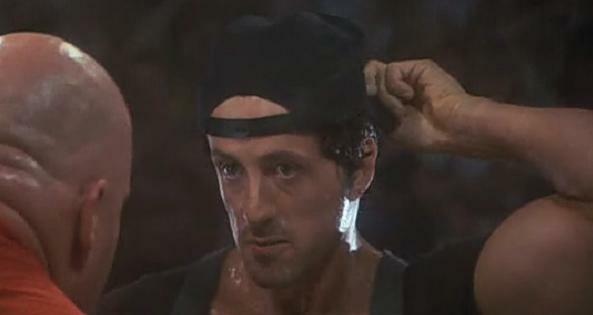 Lincoln Hawk (Sylvester Stallone) is that down-on-his-luck truck driver. He has a son whom he left ten years ago to the care of his estranged wife Christina (Susan Blakely). She is the daughter of Jason Cutler (Robert Loggia), a very wealthy man who cannot stomach someone like Lincoln being part of the family. Perhaps this is why Lincoln and Christina's son is not surnamed Hawk, but Cutler, Michael Cutler to be exact (David Mendenhall). Christina is very ill and asks Lincoln to pick Mike up at his military school. The posh surroundings don't mix with Lincoln's very working-class manners and giant truck, but as Lincoln is Mike's father the school has no right to keep Mike from him (despite the fact that Mike has never actually met his father, if I understand the story correctly). Sure, why not release this child to someone he has never known personally? We'll just take his word for it. Mike simply does not want to go, but what can he do about it? If only Jason and his men had arrived a few minutes sooner they could have stopped this road trip, but they arrived too late to stop the Hawk from taking flight (in more ways than one). Lincoln has been making money on the side through arm-wrestling competitions. He dreams of winning a big prize at an international competition, along with a large truck that could set him up for business for himself. First, there is some father-son bonding time, and to see Christina at the hospital. Mike slowly comes to warm up to Lincoln, even seeing the good side of him and arm-wrestling. Of course, that's before Christina dies. Mike is angry at Hawk and leaves with Jason. Lincoln, desperate to see Mike, ends up crashing his truck into Jason's mansion and is arrested. Mike later discovers the lengths his grandfather has gone to keep Lincoln separated from Mike and goes to find his father in Las Vegas, where Lincoln is going to take part in the arm-wrestling championship. The competition is double elimination, meaning one can lose once but still be able to move on if he doesn't lose again. Jason finds Lincoln and offers him a bribe to get him to turn over legal rights to Mike, and he flatly refuses, a brave choice given Lincoln is not the biggest or strongest competitor. Mike and Lincoln reconcile and in the end, Lincoln wins and that puts him over the top. In a certain way, Over the Top looks as if it's aiming to be ridiculously camp, something to laugh at rather than even bother to take seriously. Let's start out with arm-wrestling competitions. I'm sure there are such things, but there isn't much tension or suspense or even interest if Lincoln Hawk wins. Further, the incessant repetition that the competition is double-elimination (heard over the loudspeakers) keeps reminding us that even if Lincoln should lose one competition, we the audience won't have to worry about it since he'll get to do it again. Every time Lincoln does take part in his arms race, director Menachem Golan made the simply daft decision to have Stallone perform a routine that perhaps on paper looked good, but in practice looked comical. When he gets ready to take down his opponent, he turns his cap around. You can't help but smile, chuckle, or downright burst out laughing when you see this act. Having Mike copy this act is a bit forgivable, given the influence parents have on children, but it doesn't make it look any better. Golan, who was a master of schlock, really has no ability to direct anyone to a good performance. Either that, or everyone he hired cannot actually act. The scene where Mike interacts with local youth is cringe-worthy in terms of performances: not one of the children from Mendenhall on down are terrible. Loggia is hamming it up for all his paycheck's worth as the villain, and Stallone? Well, I think at times Sylvester Stallone has been unfairly bashed as someone who could never act. I don't think he isn't capable of actually acting. I think though his career has depended too much on trying to be a big star. Here, I think he's trying to live off the fumes of Rocky, but Golan's direction doesn't help his flat, grunting performance. The story too at times doesn't give us much to work with. When Mike confronts his father about why he left, Lincoln Hawk's only response is that he had his reasons, and leaves it at that. What exactly those reasons were I don't think we ever got an answer to. The various 'interviews' with the competitors seems almost a way to fill up screen-time, since we don't care about any of them (sometimes not even Lincoln). By the way, is it just me, or is 'Lincoln Hawk' one of the more curious names given a truck driver? The movie is more illogical given a major plot point is that this 13 year old is able to both drive and apparently fly to Las Vegas all by his lonesome. The idea that there is 'tension' at the arm-wrestling competition adds a coda on the unintended silliness. I was lead to think Over the Top was simply terrible, complete with a horrendous theme song. That isn't entirely true: the film is chock full of songs to where it can almost be a musical. As a curiosity, a bit of late 80s nostalgia, as a document to bad acting, bad directing, and a weak story, it is almost enjoyable. 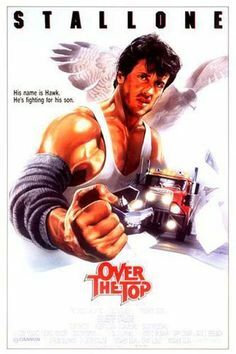 Ultimately, Over the Top isn't terrible, merely bad.